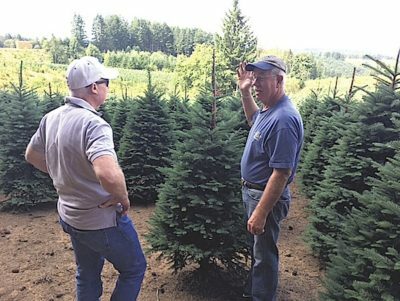 TALKING TREES, Scot Clifford (left) stands among Larchmont’s future Christmas trees in Oregon with grower Andy Heuberger in August. It will begin to look a lot like Christmas when the Wilshire Rotary Club opens its tree lot on Fri., Nov. 24 at 568 N. Larchmont Blvd. Customers will find noble, fraser, silvertip, Nordmann and Douglas firs, according to organizer Wendy Clifford, who says the trees are delivered fresh from a farm in Oregon. New tree shipments will arrive each week, with wreaths and garlands also available. Clifford tells the Chronicle that she took a trip to Silverton, Oregon, with her husband Scot in August to preview the trees that are reserved for Larchmont. Thanks to a rainy spring and a new growing process, she says the trees “are more beautiful than ever. Celebrating its 11th year on Larchmont Blvd., Clifford says the tree lot wouldn’t be possible without the support of the local community. The tree lot will be open seven days a week from 9 a.m. to 9 p.m. until Sat., Dec. 23. Delivery is available for a fee.